If you’re looking for an English seaside holiday destination with sandy beaches, rocky coves and where family attractions abound then you can’t go wrong booking a break in South Devon. I know we may be biased as locals but the coast and countryside between Exeter and Plymouth really is a full on family holiday package. So, as experts in the area, what are our tried and tested things to do in South Devon? Be warned we visited and decided we wanted to stay in Devon. It could happen to you too! What about other things to do in Devon? I hate to admit it but we do get our fair share of British weather here in South Devon. But there’s no need to hideaway and wait for the drizzle to pass. There’s plenty of family days out suited to wet weather so you can continue to explore and have fun regardless. Meet Macaroni and African penguins, Asian short-clawed otters and South American fur seals at this coastal zoo with a focus on conservation. Make the most of your visit to Living Coast by hearing the keeper talks which will introduce you to the characters at this world class marine aviary. Our girls also love the interactive sand pits which were introduced in 2018. Living Coasts is part of the same wildlife charity as Paignton Zoo so you can get joint tickets to explore both during your holiday in South Devon. Living Coasts, Torquay. Open all year round. Take a tour of South Devon’s incredible countryside, riverscape and coastline on the Round Robin tour with Dartmouth Steam Railway. You can start the steam, river and bus trip in Paignton, Dartmouth or Totnes, and spend the whole day enjoying the views. This is a hop on hop off tour so you can also explore each destination for a short time. It is a full day out and needs a bit of forward planning to make sure you meet all of your connections but the Round Robin booking office staff can advise you on this when you set off. Good news for dog owners is that your four legged friends can come too. There is a small additional charge. Dartmouth Stream Railway, Dartmouth, Paignton and Totnes. Runs March to November. Our girls love a day out at Woodlands Family Adventure Park whatever the weather. But it’s my go to place to entertain them on a wet day. There’s a couple of large indoor play areas that also house rides, slides, bouncy castles and adventure play grounds. When the weather is fine they love the large bouncy cushion, water coasters, bumper boats and tractor rides at the zoo farm. Baby is also a huge fan of Vertigo – a spinning drop ride that makes puts your heart in your mouth as you fall towards the ground – eek! Entry prices for Woodlands very during the year. Woodlands Family Adventure Park, Dartmouth. Open all year round on selected dates (weekends and school holidays between November and March). We very recently visited Dinosaur World on a wet day and think it’s a great place to go with paleontologist wannabes. It’s a small attraction in the heart of Torquay with plenty of hands on exhibits and dino facts for young enthusiasts. When you arrive you’re given a quiz to complete with a Dinosaur Expert certificate as your prize. Kids of all ages will enjoy looking for skeletons in sand pits, feeling for fossils in boxes and sitting on dinosaurs. Dinosaur World, Torquay. Open every day from April to August and then selected days from September to March. This is one of our favourite things to do in South Devon on a wet and windy day. Inside the Riviera Centre you’ll find a wave pool with splash area for kids and a flume. The waves come on every 30 minutes and we’re rarely able to drag the kids out before they’ve had three goes. After our swim we often head to the cafe for lunch. There’s a Dip and Dine deal which costs £7.50 for children and £10.50 for adults (non-members). Riviera Centre, Torquay. Pool open for general swim sessions seven days a week from 9am to 4pm. 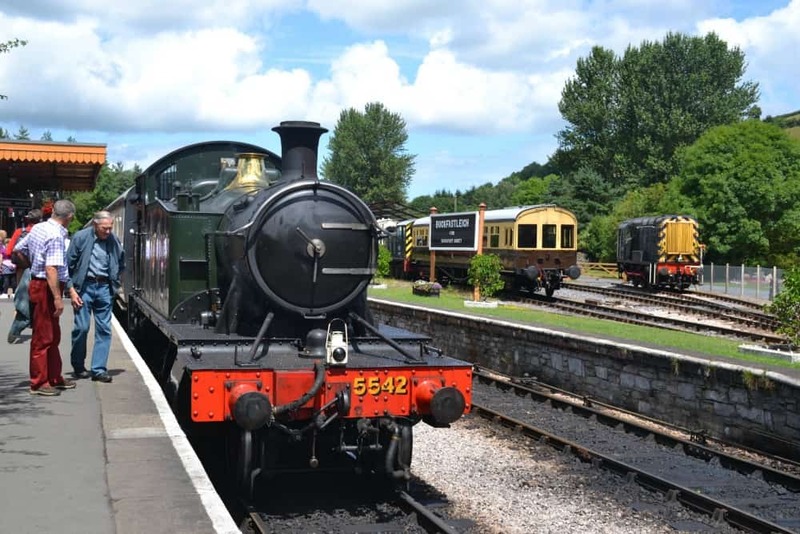 If your kids (or even you) love vintage steam trains then a ride on the South Devon Railway between Totnes and Buckfastleigh is a fun day out. 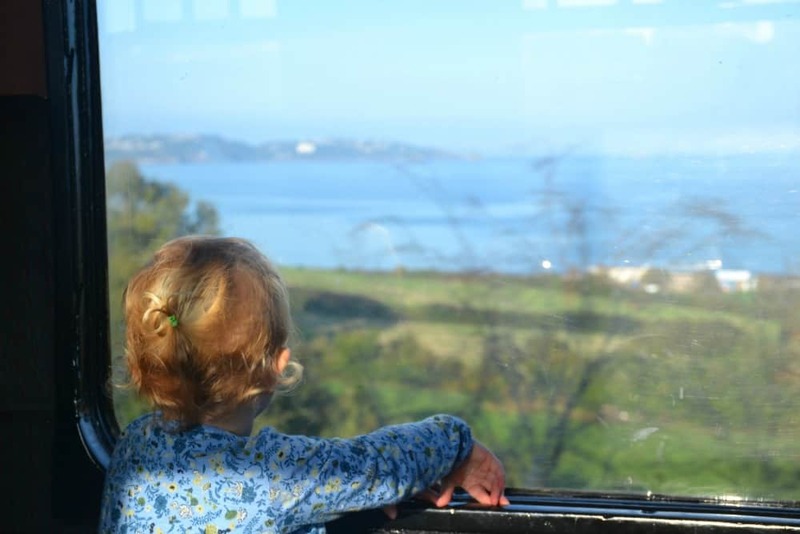 You can board the train at either end of the line, where you’ll also find other family attractions: Totnes Rare Breeds Farm and Dartmoor Otters & Buckfast Butterfies. At Buckfastleigh Station you’ll find exhibitions about the South Devon line as well as a cafe and gift shop with a model train set. South Devon Railway, Totnes and Buckfastleigh. Open from April to October and on selected dates between November and March. This naturally formed cave dating back 2.5 million years is an ideal place to visit on a wet day. It is Britain’s oldest ancient monument and evidence has been found that it was once home to Neanderthals, Homo Sapiens and pre-historic beasts. You can only explore the cave on a guided tour which can be booked in advance or when you arrive. Be aware that it might be a little spooky for very young children and the lights are turned out completely at one point during the tour. Kents Cavern website, Torquay. Open all year round. South Devon has a glut of beaches to explore, whatever the weather. If you are looking for somewhere to swim in the summer then head for Blackpool Sands which is a Blue Flag beach with a fresh water stream and clear waters off a shingle beach. If you prefer sand then Bantham Beach, Dawlish Warren and Paignton Sands are good choices. Dawlish Warren and Paignton are also a traditional seaside resorts. Bantham is surrounded by cliffs and dunes. Be aware that the roads accessing the beach are very narrow (single track most of the way) and can get extremely congested during the summer months. Pet owners will find dog-friendly beaches all year round at Goodrington Sands and Slapton Sands. Goodrington slopes gently into the sea and is sandy as the name suggests. Slapton is a long shingle beach stretching out to Torcross. The road between Strete Gate and Torcross was washed away at the beginning of 2018 but is now open again. 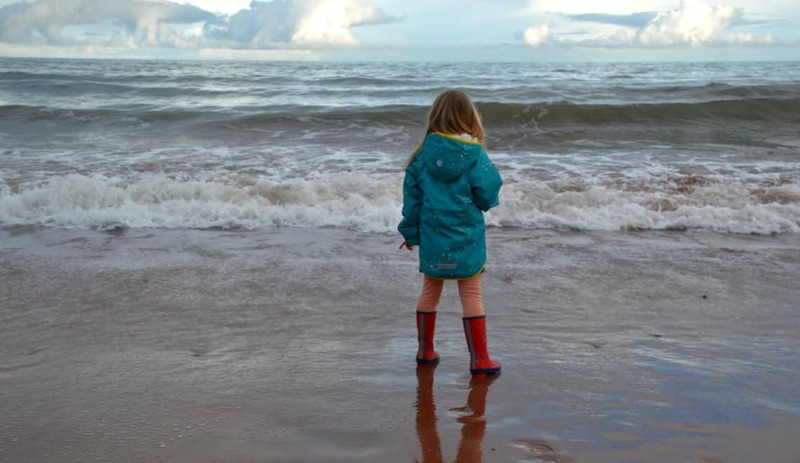 Read more about our favourite South Devon beaches for families. With two National Parks, Devon is an ideal destination for outdoor activity lovers. However, both are located north of South Devon. So how does the English Riviera compare to the likes of Dartmoor and Exmoor? I can tell you that you’ll not be disappointed. This is our go-to place for Sunday walks. Berry Head is a headland with two Napoleonic forts and staggering views of the English Channel. The water at the bottom of the cliffs is a stunning turquoise, even on a blustery day. Wander around the ruined buildings that used to house soldiers and see what wildlife you can spot in this area that is now a nature reserve. You might even see a flock of sheep grazing around the ramparts. Once you’ve built up an appetite stop by the award-winning Guardhouse Cafe for a snack, brunch or lunch. Berry Head, Brixham. Open all year round. This is an ideal day out for families who love outdoor activities, swimming and picnicking. River Dart Country Park has plenty of adventure playgrounds, cycle trails, a manmade lake complete with obstacles and pirate ship, as well as bookable activities like canoeing, high ropes and rock climbing. On a sunny day we love hanging out by the lake with a picnic and letting the kids paddle. This summer Mr Tin Box also had a go at canoeing with the girls. If you visit in the winter months there’s no entry fee. Just pay for parking. River Dart Country Park, Ashburton. Open daily from 10am until dusk. You can see the English Riviera Wheel from all around Torbay during the summer season. From October it packs up and moves to Hyde Park for the Winter Wonderland. Stepping inside one of the covered capsules is a great way to see views of the bay from Torquay to Brixham. Once whole revolution takes 12 minutes so this is by no means a whole day activity but it’s fun never-the-less. Combine it with a wander along the harbour and paddle on Torre Abbey Beach. English Riviera Wheel, Torquay. Open April to October. As well as miles of walks and cycle paths, there’s a pump track, segway tours and Go Ape at this Forestry Commission site. 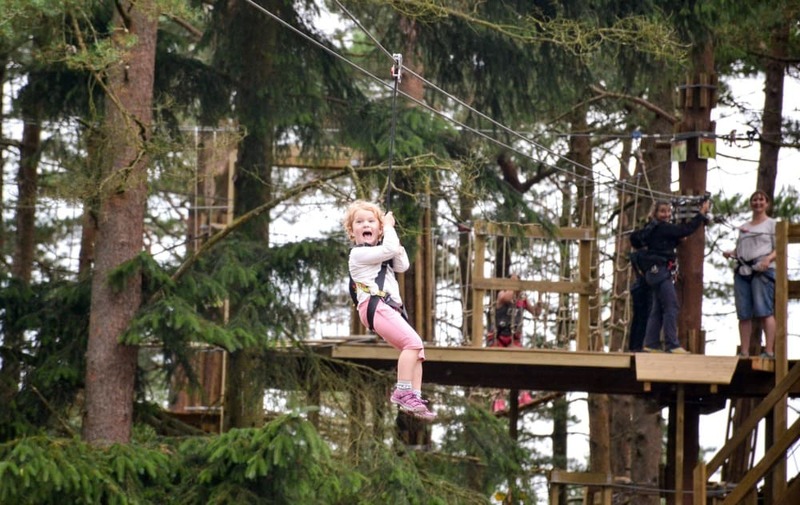 We recently took the girls around the new Junior Go Ape course and they loved it. Another of our favourite things to do here is the Highway Rat activity trail. Parking costs up to £7 for all day at peak times (weekends, bank holidays and school holidays). Bring change for the machine or pay by card in the ranger hut. Haldon Forest Park, Exeter. Open all year round from 8.30am until dusk. From the holiday home of Agatha Christie to the seat of the Earls of Devon, South Devon is awash with historic places to visit. Here’s the ones we’ve ventured to but there are many, many more! The holiday home of crime writer Agatha Christie makes for a great day out for fans young and old. 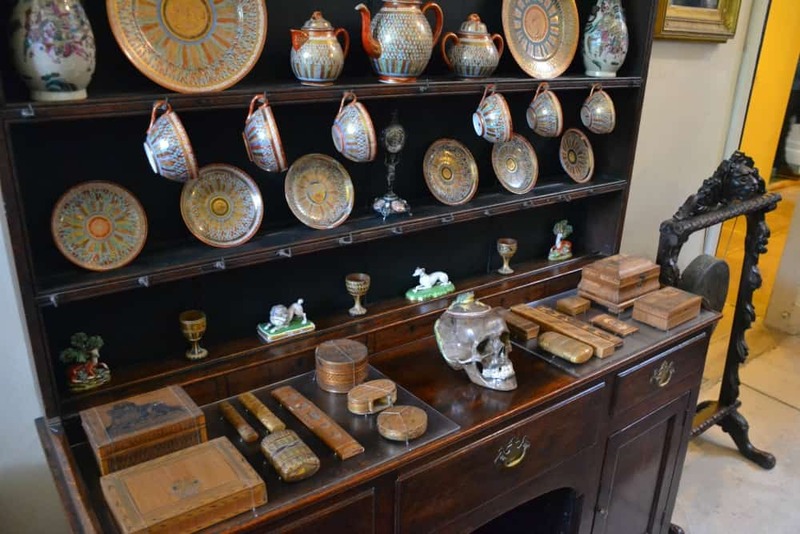 Tour her house full of curiosities, explore the folly, boat house and walled gardens, and hit about some balls in her tennis court. During our most recent trip this summer the girls loved riding round the grounds on hobby horses – it made it much easier for us to appreciate that gardens. You can also arrive at Greenway by boat, steam train or car, the first two of which make it a full day out from Dartmouth, Totnes or Paignton. Greenway, Galmpton. Open all year round. This 600-year-old family home of the Earls of Devon commands stunning views of the Exe Estuary and has a rich history stretching back to the 1300s. Today you can tour the castle with is still lived in by the young Earl and his family. There’s also a small animal farm, a play fort, a deer safari and plenty of seasonal entertainment. Visit during the school holidays for interactive shows and themed events. Powderham Castle, Kenton. Open Sunday to Friday from late March to late October. Cockington Village is one of Devon’s hidden gems on the edge of busy seaside town of Torquay. To reach it you drive down narrow country lanes that transport you to another world of thatched cottages, a working forge and a vast country park. There’s been a settlement here since Domes Day and in the past 800 years the small estate was owned by just three families. It’s now looked after by the Torbay Coast and Countryside Trust and is free to visit. Cockington Village, Torquay. Open all year round. This community hub has more than one thousand years of history. It was once a private home but by the 1900s the Hall had fallen into ruin. In 1925 it was bought by the Elmhirst family who restored it as place of creativity, learning and social enterprise. It now hosts a programme of events, festivals and courses as well as welcoming visitors to its hotel, cinema, restaurant and gardens. The estate is great for scenic walks and it’s always worth checking Dartington Hall’s website to see if they have any events on. Dartington Hall, Dartington. Open all year round. This Benedictine Monastery was founded during the reign of King Cnut and has recently celebrated it’s 1,000th anniversary. The Abbey itself is much younger but is teeming with history none-the-less. There are lawns and formal gardens including a plot dedicated to medicines and poisons. Bring a picnic or visit the lovely restaurant for a Devon cream tea. Buckfast Abbey, Buckfastleigh Open all year round. Dartmouth Castle was built in the 14th Century to defend what was then a very significant port. Today you can visit the ammunition stores, find out about the lifestyle of the small group of soldiers stationed here and climb up to the roof for fabulous views of the river, town and English Channel. If you’re feeling peckish the tiny cafe does awesome milkshakes and cream teas. You can walk to Dartmouth Castle from the town or catch a ferry from the quayside. Dartmouth Castle, Dartmouth. Open all year round. Colton Fishacre was built by the D’Oyly Carte family which owned a theatre company of the same name in London. Their Devon retreat is now looked after by the National Trust and is very different to some of the much older estates and castles you might have visited. It feels like the residents have gone away for the weekend and left their art deco home open for show. There are some lovely walks and sea views around the estate which is nestled in a valley. Make sure you have comfortable shoes on and have plenty of energy for getting back up the hill if you venture to the beach. Coleton Fishacre, Kingswear. Open all year round. The Castle dates back to the 11th Century and was originally built following the invasion of William the Conquerer. It started off as a timber construction but this was replaced with stone at about the turn of the 14th Century. It’s now one of the best preserved Norman motte and bailey castles in England. Visiting this English Heritage site doesn’t take long but is a great additional to wandering around quirky Totnes. You can climb the motte, admire the views down the River Dart and picnic in the castle walls. Totnes Castle, Totnes. Open all year round. This 12th Century Abbey turned family home has hosted the likes of Nelson and holds 600 works of art dating from the 18th Century. The museum tells the story of the abbey, its characters and the area. It is fascinating for children and adults with interactive displays, videos and talking portraits. There’s also an extensive garden which is fabulous to walk around in all seasons. The Abbey hosts many family events over the year. Torre Abbey Museum, Torquay. Open all year round. A sure fire way to entertain out girls is with a trip to a zoo or farm. Here’s a selection that make for a fun few hours or a whole day out. Learn about Dartmoor’s otters and the important work happening to protect them at this small visitor attraction which also has a butterfly and reptile house. To make the most of your visit arrive just before one of the three daily keeper guided tours. This is when the otters are fed so you have the best chance to see them in action. A keeper takes you on a tour of five enclosures to meet the three different breeds: the British otter, Asian short clawed otters and the large North American river otters. In the hot house you’ll find butterflies, Red-eared Terrapins and an Iguana. Tickets are available to combine the Sanctuary with a ride on the South Devon Railway and Totnes Rare Breeds Farm at the other end of the track. Together they make a full family day out in South Devon. Dartmoor Otters and Buckfast Butterflies Sanctuary, Buckfastleigh. Open all year round. We love this small farm where kids can get hands on feeding and petting the animals. There’s donkeys, wild fowl, goats and rabbits – all rare breeds which are being nurtured at this family-run charity. If you want to make a day of it you can combine the farm with a ride on the South Devon Railway and Dartmoor Otters and Butterflies Sanctuary at the other end of the steam train line. Totnes Rare Breeds Farm, Totnes. Open from February until November. Meet farm animals both large and small at Pennywell, including the ridiculously cute micro pigs. You simply must give them a cuddle if you visit. If you visit at Easter like us there’s hands-on lamb and kid goat feeding. As well as the creatures you can go on a tractor ride through the fields, hop on the Red Rocket trailer in the show field and a take a train ride. Our girls loved riding ponies (for an additional fee), cheering on racing pigs and the indoor play areas. Pennywell Farm, Buckfastleigh. Open from April to October and other selected dates. We had annual passes to Paignton Zoo last year and loved being able to pop in and look around at leisure. Our favourite places to go were the ape and elephant houses, the walk-through lemur enclosure and the tropical hot house. The zoo is a full day out with 2,500 animals to meet in enclosures spread across 80 acres. Prepare yourselves for a lot of walking and hills. Paignton Zoo, Paignton. Open all year round. Don’t forget there are plenty more things to do in South Devon. This is just a selection of the ones we have personally tried and tested while living here. Can you recommend any other South Devon days out? Disclosure: this post has been written as advertorial with Stay in Devon.